While we do not primarily use Google Classroom at Jamestown Community College, we do have some faculty experimenting with it. Since, I do not use Google Classroom that often, I decided to sit in on this session. Rebecca Velikaneye from Wheatland Middle School provided a thorough review of Google Classroom. She highlighted a number of the paperless benefits of this application. 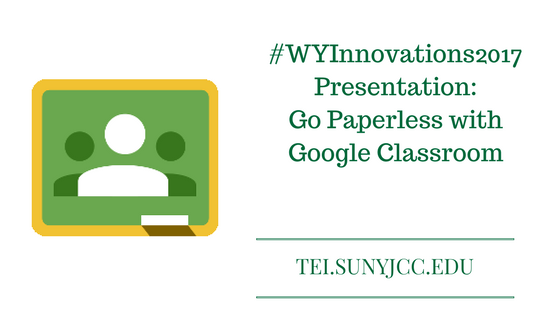 Google Classroom is not the only learning management system (LMS) that has paperless benefits. I would have to say that all of them do. Velikaneye noted that 36% of her school’s budget was being spent on copies. An LMS can significantly reduce this expenditure by putting copies online. Google Classroom has features typical of other LMSs such as a calendar for tracking assignments and exams. You can also create polls. One feature I especially liked is the ability to send one announcement to multiple classes at the same time. This is useful when you have multiple sections of the same class. When you save documents to Google Drive through Google Classroom, a new folder will be created for the specific class. Folders are also created for individual assignments. Alice Keeler shares more on this in her post, Google Classroom: Understanding the Classroom Folder. This was an informative presentation. Google Classroom is pretty straightforward. If you have experience with other LMSs, you will be able to quickly use Google Classroom.